The battle royale genre has grown faster than anyone could have anticipated over the past few years. Virtually unknown to players until someone by the name of PlayerUnknown invited 100 players to airdrop onto his BattleGround, developers have tried to implement their own takes on the genre by building upon their previous experiences. PUBG was built upon the framework of ARMA, Blackout and Danger Zone each bringing that faster style of gunplay to a larger map, and we still have yet to see how DICE’s Firestorm will set their Battlefield ablaze. This last week saw a surprise that’s been secretly in development by Respawn Entertainment for the past year and a half with the whole cycle of rumor, influencer leaks, and public release of Apex Legends so fast it gave us news editors whiplash. Now that Apex Legends is free for all to play, does it stand a chance at taking down the other champions of the battle royale genre? Apex Legends, like so many other battle royale titles before it, fits into a simple premise: airdrop into an environment, procure your weapons on site and fight your way to be the last one standing. Being built for three-person squads rather than just flying solo, Apex Legends does some smart ideas for dropping in and hitting the ground running. One player in each squad will be designated the Jumpmaster that decides on when and where to drop in order their team to their first landing point. The remaining two members are magnetically locked onto one another but can break off to cover a wider range. Each squad has a randomly selected trail that can be easy to spot on the way down, so you can easily tell on your way down whether it’s going to be a hot drop and rush to grab the first weapon you can find before you get overwhelmed by rival squads. 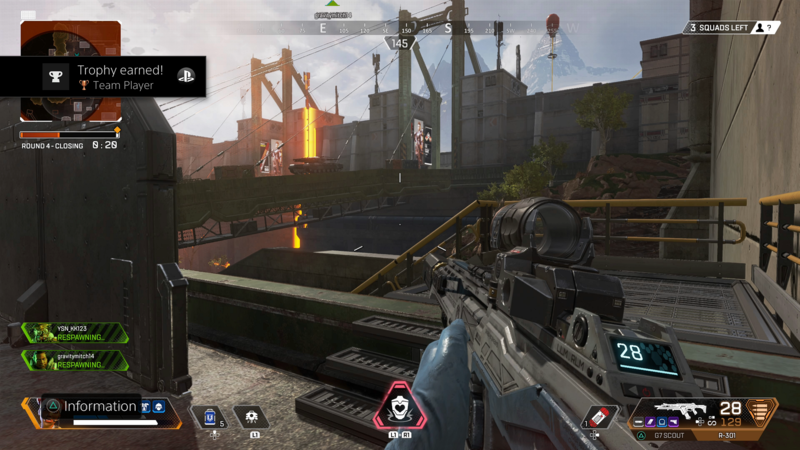 Respawn’s fast-paced gunplay has been brought over from the Titanfall series as well as much of the futuristic tech, but none of the mobility and traversal options that those mech pilots were known for (and, of course, no Titans to run into on the battlefield despite being set within the Titanfall universe). Each gun feels well-tuned against one another and as long as you’re working at the optimal range for each weapon, firefights can be matched up as a battle of skill rather than just rewarding whoever got the drop on their opponent. There’s a wide range of weapons to discover on the battlefield, from various levels of shotguns and assault rifles to energy weapons that get more effective the longer you fire them. I’ve won most of my matches with the loadout of a lever-action shotgun and assault rifle but it’s not uncommon to see a player with a pistol like the Wingman run and gun their way into first place if they can make their shots count. 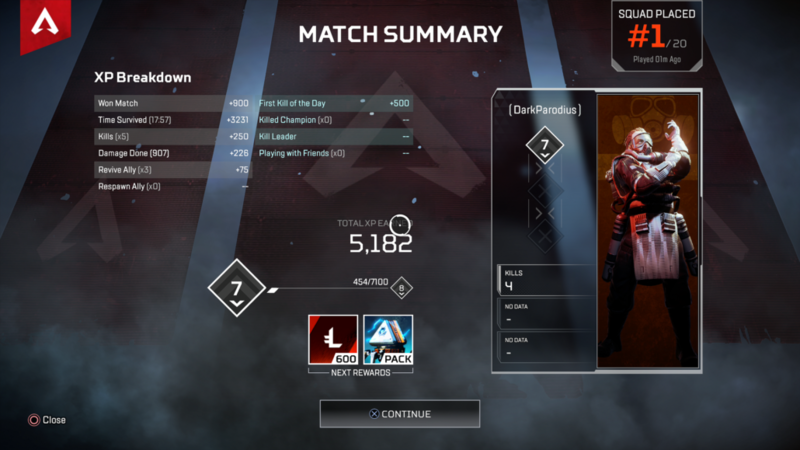 Once you throw in some of Apex Legends’ unique character abilities, there’s a lot more in your toolset to win a match than just the biggest gun on the field. Unique to the battle royale genre is the implementation of unique characters that bring more to the field than just a different body type. The hero shooter genre has rapidly grown since the early days of Team Fortress 2 and Overwatch with so many other shooters trying to figure out how to give these heroic characters more iconic and grandiose special attacks. 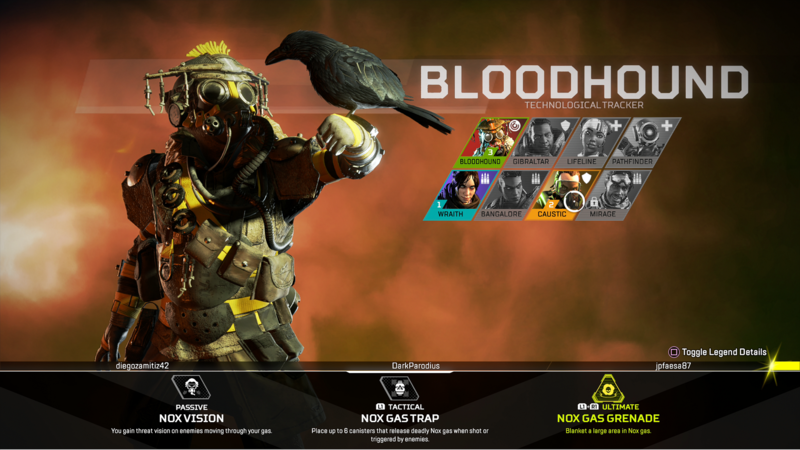 Apex Legends distills it down with a modest roster of eight heroes (six free for all and the other two requiring some sort of payment, either earned in-game currency or a few dollars) available at launch. Each legend is differentiated from one another with a passive, active, and ultimate ability. Those that bring more defensive abilities such as the healing types or Bloodhound’s ability to detect enemies and loot through walls will always be the most beneficial to team composition. Sure, you could bring along a Bangalore and use her ultimate to carpet bomb an enemy at medium range, but the best legends are those that can take out rival squads without making enough noise to draw in every other enemy nearby. At launch, Apex Legends is exclusively designed for three-person teams with a modest server cap of sixty players in total. No solo or duo play at launch might disappoint those jumping over from the latest season of Fortnite, but Apex Legends stands out on its own specifically because of the reliance on team play. Any time you’re unfortunately downed from an enemy shot, you’re given the opportunity to be revived by nearby teammates. 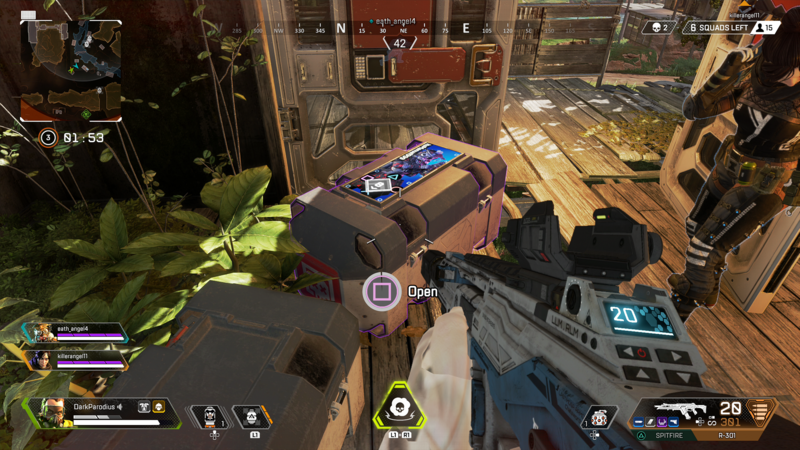 Failure to get picked up in time doesn’t necessarily mean you’re out of the match either; marking your fallen corpse is a loot container that includes everything you’ve picked up that match as well as a beacon tag. If you can make it to one of the numerous signal beacons scattered throughout the map, you might be lucky enough to be revived and dropped back into the action via aerial dropship. The unfortunate effect of being revived in such a manner is that you’ll hit the ground as naked as when the match began, so hopefully, you have a friendly teammate that can drop their secondary weapon or your previous luggage is just a short run away. When you’re downed in Apex Legends, often times you’re more defensive than when you’re running about the field. One of the upgrades that players can pick up throughout the map is a knockdown shield that can be activated to put up a forward-facing barrier that can absorb a significant amount of damage depending on rarity. I can’t count the number of times that I shot someone down but couldn’t finish the job because they snuck away around a corner to get revived by their remaining teammates. The paid hero Mirage is especially notorious for this because he can drop a decoy and sneak off just long enough to ditch the hot action. 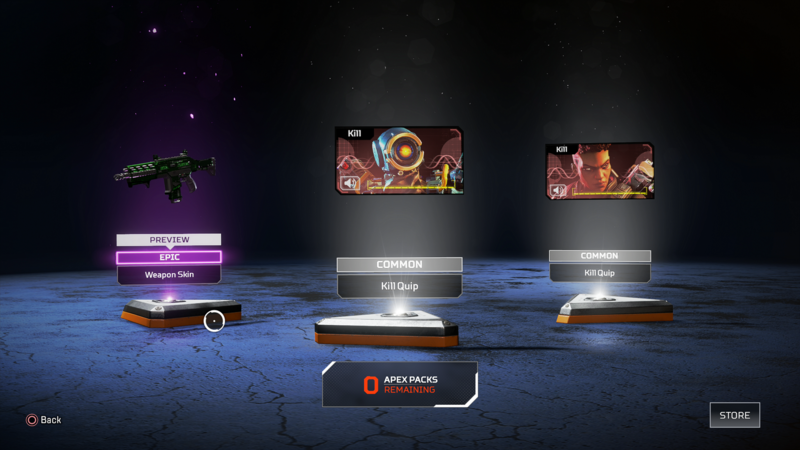 Apex Legends is completely free-to-play with real money options existing to purchase additional 3-item loot boxes called Apex Packs or the two other characters in the 8-hero launch roster (Caustic and Mirage). However, everything here can be obtained through regular play even if you’re barely ranking in half of the matches you play. Outside of the two additional hero characters, everything else that the player can unlock is purely cosmetic. This includes the usual assortment of cosmetic skins for each weapon and character but there’s plenty more to be customized. Each hero has a banner that can be outfitted to show off crucial statistics such as headshots, ability uses, and other various stats as well as banner color and character pose. These are shown off to your squad at the beginning of the match, but if you play well enough in one match, you might be crowned the Champion and have your squad’s banner be presented throughout the map for everyone else to gawk at (which also makes you a pretty big target). The weekend launch for Apex Legends has been a surprise in popularity for everyone, the players and streamers competing for first place and even the team at Respawn themselves. Unfortunately, because of this immense popularity, the launch servers have been hammered quite consistently since launch. Disconnection issues have been quite rampant on PlayStation 4 and I’ve softlocked the game three times in a single day while trying to loot a container at the same time as a teammate. I have faith that Respawn can iron out these kinks with continued support and balance patches, but the popularity as a free-to-play battle royale can certainly have an impact on performance this early on. Even with other games looming on the horizon to cover, Apex Legends has been the one title I’ve gone back to again and again over the last week. No other battle royale game has so readily captured my interest and kept me wanting to play. Even the bitter taste of defeat doesn’t sting for very long because I can just hit the ground running in the next match and have fun shooting my way to the top. Despite the rocky launch on consoles, I eagerly anticipate that Apex Legends will be here to stick around for a long while. I can only hope that new heroes can change the meta in unique ways (and I certainly wouldn’t object seeing Titanfall 2’s Cooper make the cut) to keep new content flowing for seasons to come. Reviewed on PlayStation 4 Pro. Apex Legends is a surprise addition to the battle royale genre that rewards players for team play rather than playing maverick and gunning for high kill counts. If Respawn can keep new content and characters flowing, Apex Legends easily stands a chance at being the best in the genre.